7735. Herbert Wilson REAY Jr [scrapbook] 1, 2 (Mary Elizabeth HEIDRICK , Charles Lester HEIDRICK , Cora Bell BITLER , Daniel , Daniel , John , Johannes ) was born on 18 Apr 1930 in Douglas, Cochise Co, AZ. He died on 31 Jan 2009 in Tucson, Pima Co, AZ. 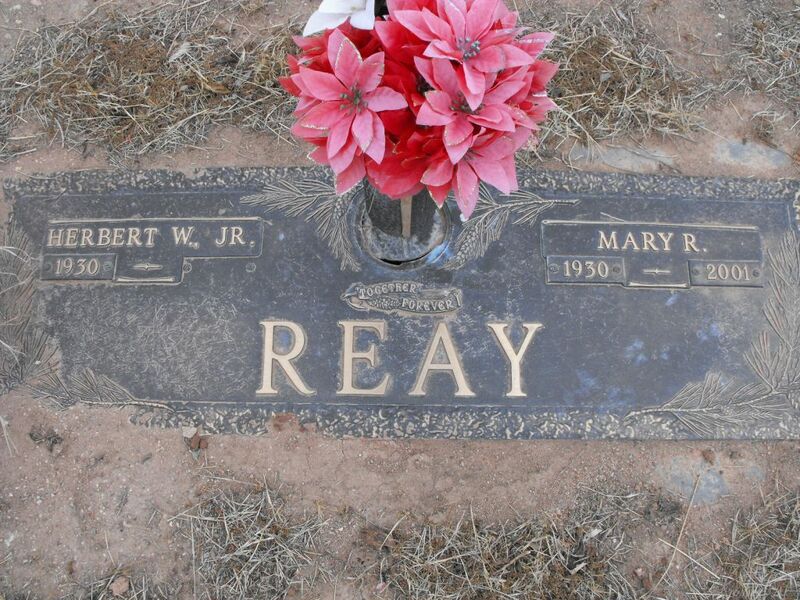 He was buried on 4 Feb 2009 in Sec 2 Row 5, Calvary Cemetery, Douglas, Cochise Co, AZ. Herbert resided in 1940 in 814 19th St, Cochise, Douglas Co, AZ. He was issued a social security number before 1951 in AZ. He resided in Oct 1973 in Tucson, Pima Co, AZ. Herbert married Mary R [scrapbook]. Mary was born on 28 Aug 1930. She died on 27 Jul 2001. She was buried in Sec 2 Row 5, Calvary Cemetery, Douglas, Cochise Co, AZ. + 13315 M i Stephen REAY. 13316 F ii Sharon REAY. + 13317 F iii Celine REAY. 7741. Janet E THORNTON (Corinne Elizabeth SHUNK , Elizabeth HEIDRICK , Cora Bell BITLER , Daniel , Daniel , John , Johannes ). Janet married Alfred J JAUREGUI. 13318 F i Julie JAUREGUI. 13319 F ii Raquel A JAUREGUI. Raquel married Wayne L STEVING II. 13320 F iii Kimberley "Kim" JAUREGUI. 7742. Sandra Kay THORNTON (Corinne Elizabeth SHUNK , Elizabeth HEIDRICK , Cora Bell BITLER , Daniel , Daniel , John , Johannes ). 13321 M i Allen WALLER. + 13322 M ii David WALLER. 7743. 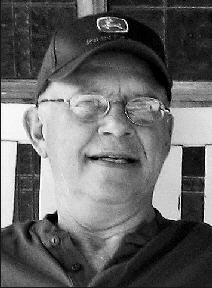 Larry Stanley THORNTON [scrapbook] 1, 2 (Corinne Elizabeth SHUNK , Elizabeth HEIDRICK , Cora Bell BITLER , Daniel , Daniel , John , Johannes ) was born on 12 Dec 1943 in Holton, Jackson Co, KS. He died on 26 Mar 2012 in Mukilteo, Snohomish Co, WA. Larry was issued a social security number in 1961 in KS. He served in the military with U.S. Navy -Boatswain's Mate 3rd Class(4 yrs) from 1962 to 1966 in Vietnam. He resided in Feb 1963 in San Diego, San Diego Co, CA. He resided in Apr 2012 in Mukilteo, Snohomish Co, WA. He worked as design department worker with The Coleman Co in Wichita, KS. He worked as design department worker with Boeing in Wichita, KS. He worked as design department worker with Martin Marietta in Littleton, CO. He worked as design department worker with Boeing in Everett, WA. He worked as contract worker with Lockheed Martin in Ft. Worth, TX. + 13323 M i Lance THORNTON. 13324 F ii Whitney THORNTON. 13325 F iii Lindsay THORNTON. 13326 M iv Blake THORNTON. 7744. Judith J "Judy" THORNTON (Corinne Elizabeth SHUNK , Elizabeth HEIDRICK , Cora Bell BITLER , Daniel , Daniel , John , Johannes ). Judy married Charles H HOAGLAND Jr.
13327 F i Marsha HOAGLAND. 7752. Thomas E HEIDRICK (Victor Gale HEIDRICK , George Washington HEIDRICK , Cora Bell BITLER , Daniel , Daniel , John , Johannes ). Thomas married Diane L TIMMONS. 13328 F i Alice HEIDRICK. April L HEIDRICK 1 was born on 10 Dec 1964 in Orange Co, CA. She died on 17 Apr 1965 in Orange Co, CA. 13330 F iii Barbara L HEIDRICK. Barbara married John L JAMES. Thomas also married Judith A SUNBURRY. The marriage ended in divorce. Judith was born on 7 Mar 1946. She died on 20 Oct 1996. Judith was issued a social security number in 1964 in MI. She resides in Oct 1996 in South Bend, St Joseph Co, IN. 13331 F iv Kimberly A HEIDRICK. 13332 F v Rochelle HEIDRICK. + 13333 M vi Thomas Victor HEIDRICK was born on 28 Feb 1972. He died on 14 Nov 2006. Thomas also married Lucy M.
7753. Terri Sue BITLER (Charles Barton , Benjamin Franklin , Daniel Franklin , Daniel , Daniel , John , Johannes ). 13334 M i Samuel Edwin WARD. 7754. Heidi Louise BITLER (Charles Barton , Benjamin Franklin , Daniel Franklin , Daniel , Daniel , John , Johannes ). Heidi married James Hamilton HILL. 13335 F i Tealah Heidi HILL. 7755. Laura Jean BITLER (Charles Barton , Benjamin Franklin , Daniel Franklin , Daniel , Daniel , John , Johannes ). Laura married Robby Allen BLACK. 13336 M i Dustin Joseph BLACK. 13337 F ii Alyssa Lea BLACK. 13338 M iii Isaac Robert BLACK. Laura also married Kit CHASE. 13339 M iv Tai Kit CHASE. 13340 F v Malia Van Frances CHASE. 7763. Ann WAYLAN (Mary Alice ROSSILLON , Marjorie Elizabeth BITLER , Daniel Franklin , Daniel , Daniel , John , Johannes ). Ann married Chris T BRACKENRIDGE. 13341 F i Cora Elizabeth BRACKENRIDGE. 13342 M ii Carson Waylan BRACKENRIDGE. 7777. Amanda FOSTER (Barbara Ann BETHKE , Esther Elnora Eileen BITLER , Daniel Franklin , Daniel , Daniel , John , Johannes ). 13343 M i Matthew WOODS. 7778. Raymond Clarence "Bud" BRICE 1, 2, 3, 4, 5, 6, 7, 8 (Margaret Ruth BRAUCHER , Lillie May HINES , Maggie Moss BITLER , Daniel , Daniel , John , Johannes ) was born on 2 Sep 1932 in Madison, Greenwood Co, KS. He died on 31 Dec 2007 in El Dorado, Butler Co, KS. He was buried in Sunset Lawns Cemetery, El Dorado, Butler Co, KS. Bud resided in Fall River, Greenwood Co, KS. He resided in 1940 in South Salem Twp, Greenwood Co, KS. He graduated from Eureka High School in Eureka, KS. He resided in Jun 1945 in Eureka, Greenwood Co, KS. He was issued a social security number in 1952 in MO. He resided in 1956 in El Dorado, Butler Co, KS. He resided in Apr 1961 in El Dorado, Butler Co, KS. He resided in Feb 1989 in El Dorado, Butler Co, KS. He resided in Dec 2007 in El Dorado, Butler Co, KS. He served in the military with U.S. Army. He worked as Operator - Fractional Unit with Texaco Refinery. He worked as cattle rancher. He was a member of United Methodist Church in El Dorado, KS. He was a member of Lion's Club. He was a member of Texaco Retirees. He was a member of Local O.C.A.W. 5-241. Bud married Vera L SHORT 1, 2, 3, daughter of Warham Robert SHORT and Viola Mae CHAMBERLAIN, on 23 Nov 1955 in Hamilton, Greenwood Co, KS. Vera was born on 21 Nov 1934 in Hamilton, Greenwood Co, KS. She died on 25 Nov 2012 in Wichita, Sedgwick Co, KS. She was buried in Sunset Lawns Cemetery, El Dorado, Butler Co, KS. Vera graduated from Hamilton High School in Hamilton, KS. She graduated with BA from Emporia State teachers College. She resided in 1956 in El Dorado, Butler Co, KS. She worked as teacher. She was a member of Trinity United Methodist Church. She was a member of NEA. 13344 F i Melodee Ray BRICE DDS. Melodee married Mark Howard ARMFIELD DDS. 13345 F ii Susan Annette BRICE. 13346 M iii James Kyle BRICE. + 13347 F iv Vera Dyann "Annie" BRICE was born on 14 Dec 1971. She died on 18 Apr 2007.